Actual BW 80 lbs. Weigh Date: 4-10-19, 1374 lbs. Out of a real long-bodied cow with an exceptional production record. 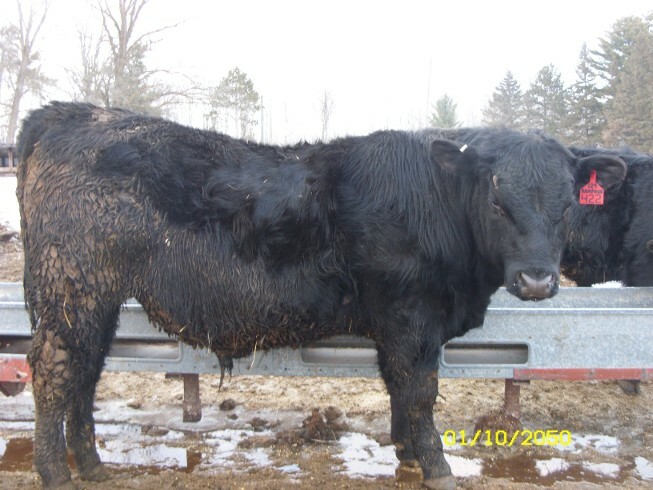 She has 8 calves with an average 205 day of 727 lbs. and made Pathfinder status with an average weaning ratio of 109 on her first 3 calves! R-422 was weaned off at 777 lbs. @ 219 days. Sire is a son of Quaker Hill Rampage who ranked #1 for registrations in 2018. If you looking for a long bodied taller bull that stands above the rest, this guy is it.